Kansas owes more than it owns. 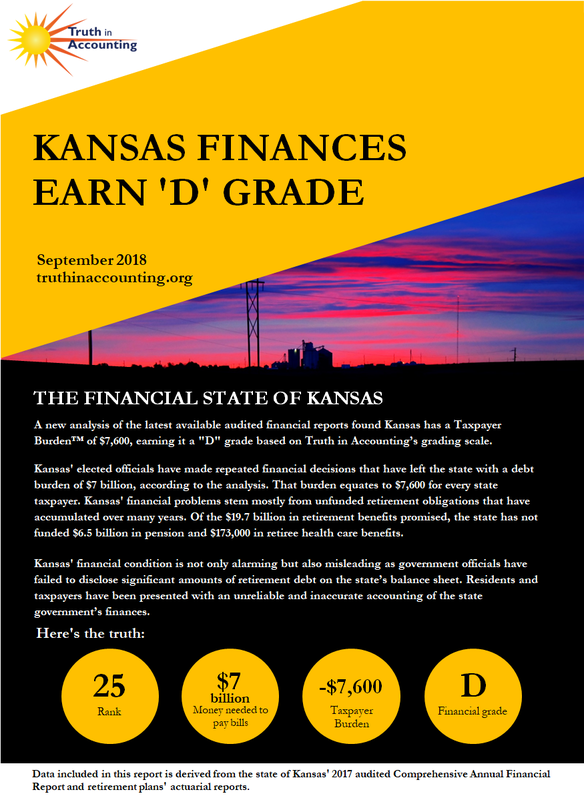 Kansas is a Sinkhole State without enough assets to cover its debt. 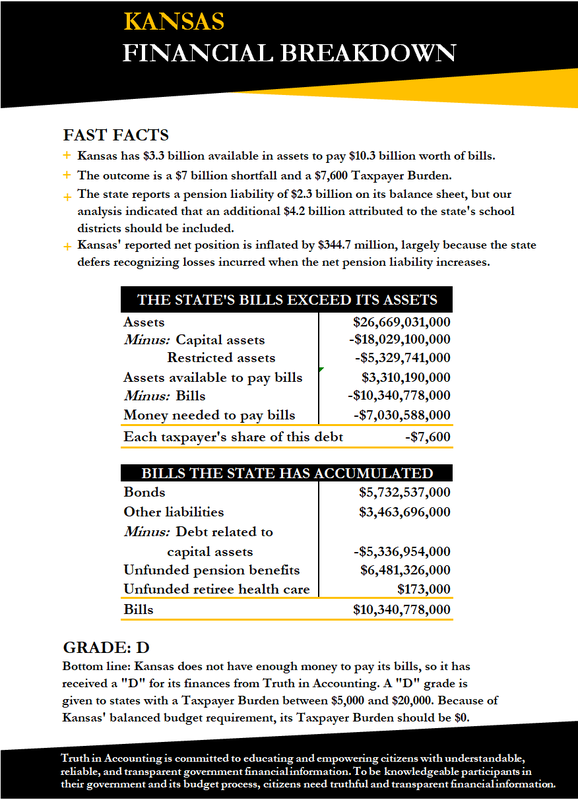 Kansas only has $3.3 billion of assets available to pay bills totaling $10.3 billion. Because Kansas doesn't have enough money to pay its bills, it has a $7 billion financial hole. 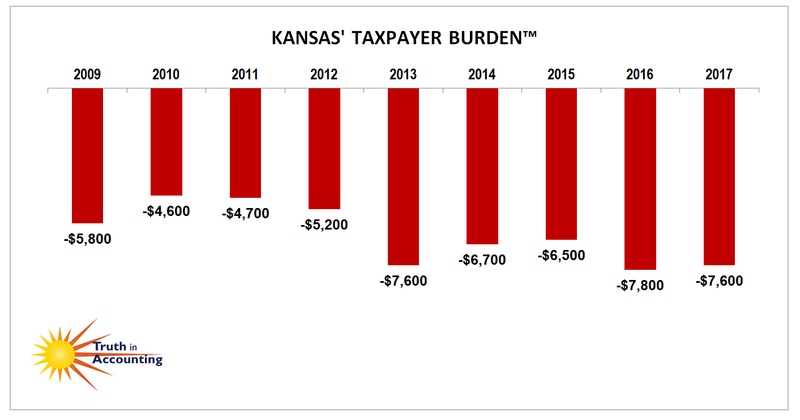 To fill it, each Kansas taxpayer would have to send $7,600 to the state. Kansas's reported net position is inflated by $344.7 million, largely because the state defers recognizing losses incurred when the net pension liability increases. Despite a recently implemented accounting standard meant to increase transparency, Kansas still excludes $4.2 billion of pension debt from its balance sheet. The state's financial report was released 140 days after its fiscal year end, which is considered timely according to the 180 day standard. “Democratic Gov. Laura Kelly worked Monday to rescue a key budget proposal that would reduce Kansas' annual payments to its public pension system by trying to sell the plan to wary retired teachers and government workers. Kelly's plan faces widespread opposition among Republican lawmakers, who view it as her way of freeing up state funds for additional spending on public schools and government programs. … She insisted she isn't trying to free up money for new spending and said retirees have heard "a lot of misinformation."